The history of the Africentric Personal Development Shop (APDS) has now been unfolding for over sixteen years. 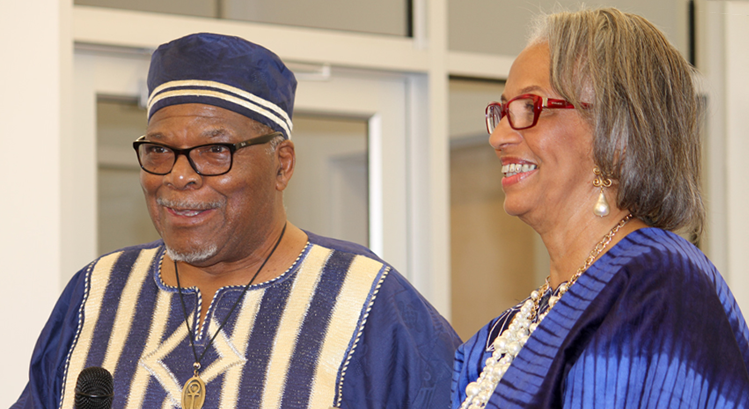 It began when Niambi (Barbara) and I knew that I was going to retire from The Ohio State University. We acknowledged that I was not going to sit and do nothing. 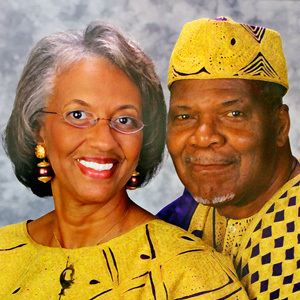 We also knew that we had been active in the African community throughout our marriage. Therefore, what ever I did would continue this community work. So, we examined what work had been done in order to get clues for future activity. Some of the community work included participation in independent African schools, private African centered counseling offices, Africentric counselor and teacher development and the development and implementation of the African Center for Study and Worship. After looking at all of these areas of activity, we recognized several common threads and needs. Niambi and I also noted that we had participated longer and more intensely with the African Center for Study and Worship than we had with any other single community institution. Thus, as we examined the building blocks proposed by the African Center for Study and Worship which were a food cooperative, home remodeling, African school, physical fitness center, African social service and counseling center and others, we decided that we would implement the building block referred to as the African Social Service and Counseling Center. It is out of this that the seeds of APDS were formed. Shop—People would come to seek an array of growth experiences, without being stymied by clinical services being implied in the name. The name is important at another level because imbedded in the name is the philosophy and mission of APDS. It must be kept in mind that in spite of the rather extensive struggle with the name (Africentric Personal Development Shop), the intent was to serve perhaps four to six clients a week as a retirement activity. It was soon discovered that the Ancestors and the Creator had other plans. We opened our office in a small space (at the end of the hall) in the Columbus Model Neighborhood Facility at 1393 E. Broad St… The second day that we opened a client found us. (We had done no promotion and told very few people). We were shocked! A plan of service was worked out for her which proved to be effective. She became behind the scenes ambassador who has promoted APDS throughout its existence. Thus, growth became evident and APDS incorporated as a not for profit agency in November of 1988. Before the end of 1989, APDS hired two employees and was serving more than twenty-five clients weekly. 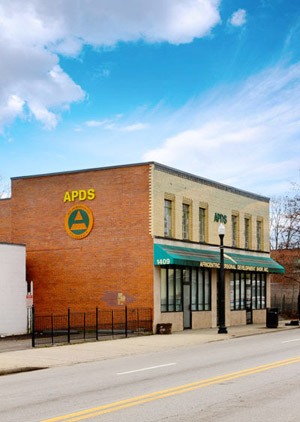 During the first three years, APDS had acquired a grant from the Ohio Department of Alcohol and Drug Services (ODADS) and a contract from the Cuyahoga Department of Human Services. APDS continued to grow with private clients, contracts and grants. By 1996, major funding was secured from the Franklin County ADAMH Board, Columbus City Council, Franklin County Commissioners, Franklin County Juvenile Court and the Columbus Foundation. Contracts were acquired from Ohio Department of Rehabilitation and Corrections (two prisons). At this time, APDS had out grown its space (even with the move across the hall to a larger area) and the addition of a dilapidated “outreach center” was inadequate. An old warehouse with four apartments at 1409 E. Livingston Ave. was purchased in 1997 and the remodeling began. It is important to note that a very dedicated, devoted and supportive Board of Trustees throughout ups and downs, successes and failures enabled APDS to grow and grow and be an effective African community agency. These strong people (individually and collectively) gave of their time and talents to insure the success of APDS. As co-founders and retired leaders, we want each and every one of the Board members to know how important their contributions have been no matter how long they served. An important contribution that APDS has made to the community and nation is to provide leadership for the development of the Africentric Rites of Passage. This has carried over into local, state and national agencies and institutions. An important aspect of the Africentric Rites is the training and establishment of the APDS Council of Elders which was organized to provide wisdom and guidance to APDS as well as schools, other agencies and institutions. In 1997, the leadership baton was passed to the current President and CEO, Brother Jerry Saunders. Brother Saunders has made his special mission to stabilize APDS and stimulate excellence as the major objective for service delivery. Established for staff and consumers/client is the agency motto “Helping People Help Themselves”. Brother Saunders has declared that the atmosphere (mentally, physically and spiritually) must be “fit for queens and kings” for customers/clients and staff. It is clear that the stage has been and is being set for APDS to be the premier institution in the city, county, state, country and internationally.. The history of APDS is yet to be told. However, as African centered minded and actioned people and organizations demonstrate pooled support nothing will be able to stop the Africentric Personal Development Shop’s growth. Victory is ours, APDS is on the move!